Countering Violent Extremism (CVE) is a toxic mix of surveillance, profiling, and thought policing. DRAD has opposed the program since its inception, working with local and national coalitions to expose its dangers. It’s based on demonstrably debunked theories that there is a set path to “radicalization” that can be used to predict who will become a terrorist. In seeking to reach people “before” they become terrorists, CVE casts suspicion on people for their First Amendment protected views. CVE has been used to disproportionately single out the Muslim community. CVE is touted as an alternative to law enforcement interventions against terrorism, focusing on at-risk individuals and preventing them from becoming “extremists.” However, nothing could be further from the truth. CVE is jointly run by the Department of Justice, Federal Bureau of Investigation, and the Department of Homeland Security. There is nothing to prevent these groups from using these programs as intelligence gathering. They also seek to transform teachers, social workers, and health care workers into informants. In the wake of the horrific violence at Charlottesville, many looking for answers about how to deal with resurgent white supremacist movements have turned to CVE as a potential answer. 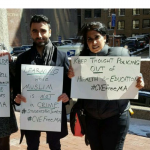 However, Muslim, Arab, and South Asian civil rights groups that have long opposed these programs have made clear that they still do. Regardless of people’s good intentions, CVE programs will continue to single out the Muslim community for scrutiny. It is not possible to fight white supremacy by legitimizing a tool that will be used to criminalize the Muslim community. 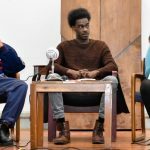 January 29, 2018 – Boston is a city that prides itself on its progressive politics. 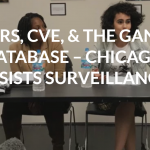 But it’s time to take a closer look at surveillance and policing in the city. 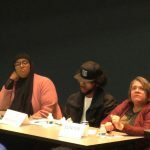 December 1, 2017 – The American Friends Service Committee and the Social Justice Initiative at University of Illinois Chicago hosted a “Resisting Surveillance” panel investigating surveillance programs in Chicago, and how communities are resisting these racist, invasive and dangerous practices. September 8, 2017 – CVE programs combine profiling, surveillance, censorship, and even thought control. They aren’t the right tool to help us fight white supremacy, because they have been, and will continue to be, used to enforce institutional white supremacy.